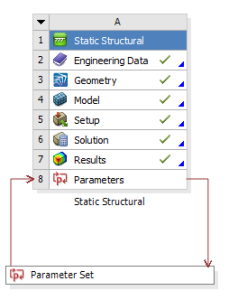 Modern FEA packages such as ANSYS allow for the rapid optimisation of structures based on parameterisation of geometry models. Key parameters can be automatically manipulated, allowing the analyst to track key performance indicators such as mass, peak stress, deformation and natural frequency. The graphical information facilitates the selection of the optimal solution for any given specification. More automated design optimisation techniques are also available using ANSYS DesignXplorer, which allows goal driven optimisation methods to direct product development. Techniques such as shape or topology optimisation allow the FEA package to converge upon the optimal design given a set of loads, restraints and initial design space. The objective was to reduce the mass and hence inertia of primary hoisting equipment within a machine, therefore enhancing machine performance with faster machine accelerations and reduced cycle times. The lifting carriage had a 10 tons SWL and was optimised for weight and service life (fatigue). In this case the design achieved a 10% reduction in mass, while simultaneously achieving the target service life for weld fatigue.